Sunday night there was an earthquake. When it happened, I was surprised to feel it, and concerned because the apartment where I am staying is on the 5th floor. Luckily my host was still up working as well, and we checked the Internet for any news, but couldn’t find anything at the time. Coming from the central coast of California, I am accustomed to little local earthquakes that rumble but do little damage, so I didn’t stop to think about the destruction that might have happened elsewhere. After checking the news one last time, we both went to sleep, and it wasn’t until the next morning that we knew what had really happened. The photos tell such a sad story, and when I left the house for the expo, there was a tangible sadness and hurt that permeated throughout the city. I could hear the many conversations taking place at the bar where I had my breakfast of cappuccino and croissant; people discussing friends and relatives near the area, their attempts to contact them, and prayers for their safety. It was a quieter day at Vinitaly, and during my first appointment with Luca Currado, winemaker for Vietti in Piedmont, there was a minute of silence. Luca’s wife was frustrated that the lights were not dimmed during the silence, as I was by the handful of people talking and going about their business. Luca a 3rd generation family member, talked a bit about their philosophy at Vietti, and I continue to be impressed by this winery after being introduced to them 7 years ago by friends in Austria. 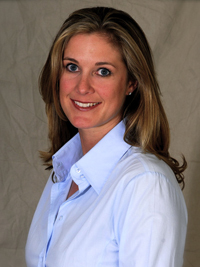 The family’s mission was to bring the winery to a higher level by expressing their passion for terroir. Luca, who honed his winemaking skills in Bordeaux and California, saw that the “Revolution” of Nebbiolo, creating Barbaresco and Barolo, left the other Piedmont grapes Barbera and Dolcetto behind. It wasn’t thought that Barbera could be a truly great wine, and therefore the grapes were previously planted in poorer areas that wouldn’t sustain great Nebbiolo vines. But, after a huge financial investment and leap of faith by Vietti, Barbera and Dolcetto were planted in supreme locations, and, combined with good winemaking, the result was a “wow factor” especially for young wine drinkers, looking for value and quality when purchasing wine. I revisit my comparison between Barbera d’Asti and d’Alba with the La Crena, and Tre Vigne, respectively, and again conclude that I prefer the Alba. Luca jokingly tells me he likens the Alba to Grace Kelly and the Asti to Angelina Jolie, which I think perfectly, emphasizes my choice. Grace Kelly was an elegant classic with a slight edge. The other wine to result from this investment, the Dolcetto, is wonderful and a must-try, with bright aromas of licorice and berries, and a juicy fresh fruit flavor and a long, perfumed finish. Not only is Vietti fortunate that this investment paid off with beautiful wines, but we, the consumers are as well, and should be thankful for this undertaking. Another prize for Barolo lovers looking for a great value is the Nebbiolo Perbacco, a very important production for the winery (and wine drinkers as well.) After the grapes for the Grande Cru Castiglione Barolo (from different vineyards) are crushed and aged according to Barolo regulation, the top barrels are selected for blending, and the “leftover” wine that can legally be classified as Barolo is bottled as the Perbacco. Why? 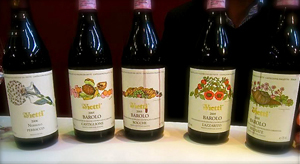 Simply because Vietti refuses to make a regular Barolo, so they instead make a spectacular Nebbiolo that shouts aromas of leather and vanilla and flavors of toasted vanilla and strawberry ending in a fruity and tannic finish. This “Baby Barolo” retails for under $25, and should be considered an extreme value. I was lucky enough to finish our discussion and tasting with the three single vineyard Barolos, Rocche, Brunate and Lazzarito, named for the hospital nearby which was a refuge for sufferers of the Black Plague. The hospital builders decided that anyplace that had a history (in 1640!) of producing such beautiful wines, it should be a good place for health and healing. 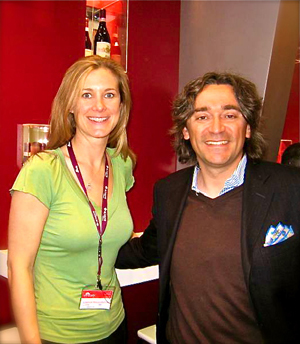 I want to note here that I was very lucky to have had some time with Luca during Vinitaly, and actually got the appointment because I mentioned to his wife the day before that I had met him a couple of months ago in Las Vegas at a tasting at the Double Helix wine bar at the Palazzo. 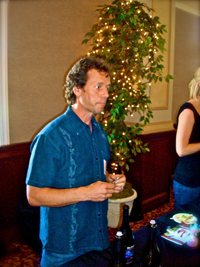 I had attended the $5 weekly wine tasting because I saw that Vietti was the featured wine, and was shocked to have the chance, with only 15 other people, to meet the winemaker…and have him sign a bottle of wine! So, support your local wine shop, wherever you are, because you never know what kind of opportunities will be uncorked. 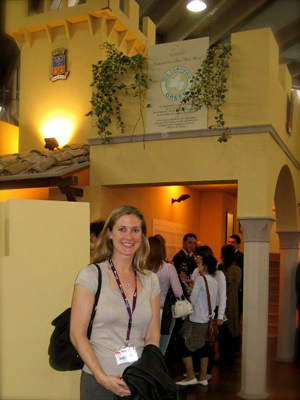 Since this was the last day of Vinitaly, I knew I had limited time to get two more tastings in, at Villa Girardi, owned by the famous Tommasi family, and Antinori’s group of wineries. I headed to Villa Girardi first, where Franco Tommasi, whom I saw briefly the other day, greeted me warmly. I started with the whites, which Franco told me are what the people of Verona (Veronese) drink in the morning, because they do not need food to be delicious. I love the Soave of course, but also enjoy the Santa Giustina blend of Garganega, Tokai and Malvasia that offers explosive flavor without sweetness. I also enjoy the unrecognizable “I Mulini” Pinot Grigio, a delicious departure from other over-marketed brands. We move on to the Bardolino, an easy-drinking favorite of mine, which I think goes very well with Thanksgiving dinner. We move forward to the Valpolicella and then the Ripasso, and Franco takes out the crates of shriveling grapes that he has on display to explain how the grape clusters are cut and dried until they lose 40% of their weight. This was a good visual because I had previously pictured the “dried” grapes as looking more like raisins. From the first crushing comes the prized Amarone with its intense aromas of tobacco, clove and cherry jam, then pleasant prune flavors and a lingering finish. I am familiar with the family’s Tommasi Amarone Classico and am further impressed with the Villa Girardi expression of this wine. Franco can see my eyes glazing over and brings me a plate of Parma ham, cheese and bread and says, “take 5 minutes and relax, I’ll be back,” what a gem. I eat like a starved prisoner, and it is hard not to pick up the glass of wine and enjoy sips with this meal. 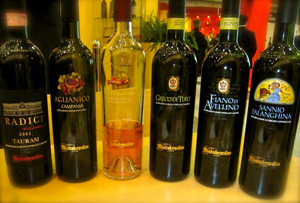 I leave refreshed and take a brisk walk over to the Tuscany pavilion to find the Antinori booths. My contact there was not available, but Rita came to walk me through a tasting of some of their selections from the “La Braccesca” label, whose Vino Nobile di Montepulciano holds a special place in my heart because my best friend and I shared a bottle over dinner after she had guided me through the Uffizi Gallery’s masterpieces as only an artist could. I saw things that day that I had never seen in four previous visits, little secrets left behind by the renaissance artists 400 years ago. I was lucky enough to try three of their most special wines, the Chianti Classico Cru “Badia a Passignano” and the “Super Tuscans” of Tignanello estate, Tignanello and Solaia, ones that other tasters asked for but were denied. I think that made them taste even better, but they really did not need any help in the first place. I particularly liked the Solaia’s woodsy and mushroom flavors and dense garnet color. 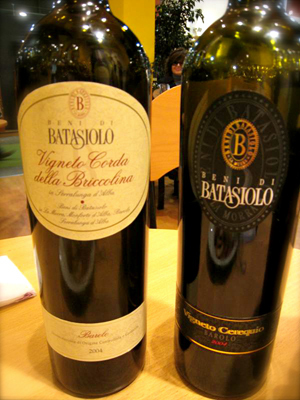 The base of this wine is mostly Cabernet Sauvignon, while Tignanello has a higher percentage of Sangiovese. Afterward, Rita took me to another stand housing their new winery in Puglia, Tormaresca, where Francesco Domini poured some impressive whites and reds, and a delicious not-yet-exported Calafuria Rose from Negroamaro grapes. Of the whites, including the Pietrabianca Chardonnay and Fiano blend, I thoroughly enjoyed “wow” aromas of apple and citrus from the Chardonnay IGT and its crisp flavors of pear and apple. This wine is fermented in barrels then aged in stainless steel before bottling and this makes an altogether different and delicious Chardonnay, for those of you looking for a fresh take on an old favorite. My favorite of the reds was the Bocca di Lupo estate Castel del Monte Aglianico, which I found to be quite different from those of Campagna, and very elegant. Francesco tells me that this is due to the lower altitudes and rockier soil than their northwestern neighbor. This full-bodied wine is full of fruit and spice, with nicely balanced tannins. 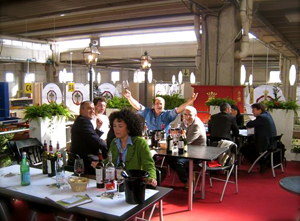 Though I think I am not quite ready to end my experience at Vinitaly, stands are packing up and partying has broken out. To be honest, I am not sure that I could taste another wine. The Abruzzo pavilion is empty, as the exhibitors have returned to their region I am sure with anxious hearts, and I hope they are able to soon find some peace after this tragedy. Despite my original intentions to take the day off from the expo, today was my “Winnie the Pooh-style” day of wandering, visiting and enjoying this Vinitaly experience. After the fun and late night before, I slept in and was fortunate to get a ride from Piero, my host, to the expo as he was on his way to a family lunch near the lake (Garda). I had one more Sicilian winery to visit upon recommendation, and that was Vini Biondi, where my hosts, Ciro and Stefanie cheerfully welcomed me. This winery is in the high elevations of the Etna region of northeast Sicily, and even in this small area, I learned that there were significant differences in the soil from vineyard to vineyard. The family has owned these vineyards since the 1600s and in the 1930s; wines brought by the grandfather to France for a competition received awards there. The first of three wines I tasted was the Etna DOC Bianco called “Outis” which is ancient Greek for “Nessuno” which in Italian means “No one.” They tell me that their desired name Nessuno was already registered as a wine name, something I have heard a few times while visiting the stands. It is like domain names on the Internet, everything seems to be already taken. This wine has a mellow floral aroma, and a slate-y taste (which I like) and a faint and amiable saltiness to it. Next, I tried the “3 bicchiere” award winning 2005 Etna DOC Rosso, a blend of several indigenous grapes from various vineyards aged in used barriques. With a slight salinity, this wine is smooth and acidic while still being enjoyable. I then tasted the 2007 Cru, which will be called M.I. because due to regulations, they cannot use the geographical name, Monte Ilice for the wine. This wine has not yet been bottled, and I thought it was exciting to get to taste something “pre-production.” Aromas of orange blossom and honey gave way to a more earthy and dry savory herb taste and a simple but lingering finish. Ciro and Stefanie recommend another winery in Piedmont whose owner likened these Sicilian wines to his own, even though they are at the two farthest points in the country. This I had to see for myself. On the way there, I stopped by the large castle display of Banfi and was able to talk with Alessandro, in charge of European sales, and taste some of the newer concepts at Banfi. I learned that they make their own barriques, something no other Italian wineries do, in order to control the aging and toasting of the wood (preferring lower heat for longer periods) for extracting more delicate flavors. The philosophy of this large label which produces over 40 wines, is to treat each estate as a boutique winery, as if each were its own and not part of a larger group. We start tasting with the 2008 Centine Bianco, an every day drinking wine with appealing mineral and citrus fruit aromas and a soft peach flavor that also has a nice balance of flavor and acidity. Next we tried the Belnero Toscana IGT, a blend of Cabernet, Merlot and Sangiovese. Alessandro tells me this is their modern concept of Sangiovese and corresponds to the research they did when developing the Poggio al Muro Brunello. I enjoyed the aromas of coffee and chocolate, as well as the softness and fullness on the palate. To compare, we then tasted the just-released 2004 Poggio al Muro Brunello di Montalcino, which received 94 points from Wine Spectator. This wine is a deep garnet color with strong tobacco and spice aromas. The taste was bold in the mouth, issuing flavors of ripe dark cherry and coffee. 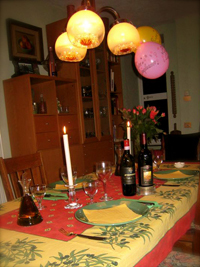 I am thinking back to my birthday and the bottle of Banfi Brunello that we enjoyed with dinner, and smiling. 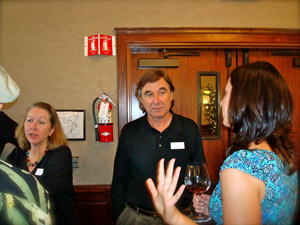 I love that these people are so passionate about making and developing wine! Feeling hungry, I made my way to the little bar for a sandwich and took it to the lounge to eat in peace. I am amazed at my diet in recent days, mostly bread, which is the polar opposite to my normal gluten-free regime. Maybe like re-setting my watch to the current time zone, my body has been reset for the current food zone. My next visit was to the Sella Wine Estates in Piedmont, where Gioachino Sella greets me and introduces me to their terrior by way of two bowls of soil sitting at the tasting table, one full of rocks and decomposed granite and the other, full of grey sand. This is going to be interesting, I thought. As beautiful pictures of the estates fade in and out in a digital picture frame, I learn that the Sella family has produced wine from their own vineyards since 1671 and is one of the oldest active Italian wine producers, with bottles still in their cellars dating as far back as 1881. That IS interesting! I read in their brochure that the estate maintains its original artisan scale and produces only limited amounts of quality wine. Also, that they produce in a classical style (not to be confused with “old”) which to them means that the most authentic characteristics of the terroir and the vines are brought forward and aged in neutral wood. I begin tasting a range of 9 wines with the Doranda Coste della Sesia DOC, made from 100% Erbaluce grapes. This is their only white wine, and a grape indigenous to Piedmont that I have never tasted. It offers aromas of almond and wildflowers, and a richness that surprises me. Next, the Nebbiolo Rose which has not been bottled yet, then on to the blends where I taste for the first time the Croatina grape with its strong tannins. Then, another first, the taste and aroma of iron and rust found in the signature wines made from 80% Nebbiolo and 20% Vespolina grapes. This is a new sensation for me, and it was the “I Porfidi” with an addition of 20% Croatina that won me over to the taste which is enhanced by the flavors of blueberry and vanilla. 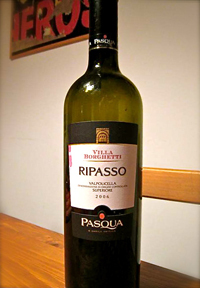 This wine’s 2003 vintage won the “3 bicchiere” award by Gambero Rosso. As I am writing this, I can hardly read my notes…it must be because I was tired or writing furiously. Yes, I’ll stick with that. After thanking my hosts, I continued on my Winnie the Pooh day and stopped by the Batasiolo booth to thank them for the dinner and fun the night before. Again, I found myself admiring the friendliness and “joi de vivre” that is found in the people there. 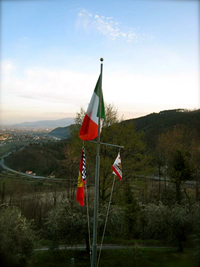 I look forward to visiting them in May as I make my way through Piedmont, Torino and the neighboring towns. Now, as in any good Pooh story, there must be some element of adventure or surprise. On my way out of the pavilion, I stopped to take a photo of a particular stand and noticed that something hit my foot. I looked down and saw a champagne cork that was still surrounded by the neck of the bottle. Of course, I knew how this had happened, as I happen to be quite adept at shearing the top of a champagne bottle with a sabre. I could hear some commotion around the corner, so I picked up the cork and walked over to the group and asked, “Is this yours?” A little embarrassed, they apologized and sweetened the deal by offering me a glass of their champagne. Fair enough. It was the first thing I had liked and didn’t have to spit out that day, and it was kind of nice to enjoy the “end-of-the-day” atmosphere. When it comes to classifying myself as one of the Pooh characters, my friends and family would probably choose rabbit (on bad days) or piglet, but today I was a relaxed and jovial Pooh, and proud of it. Unfortunately if I ever write a cooking book, I won’t be able to use the title “Cooking with Pooh” because it is already taken! I am not kidding, you can look it up. In preparation for the Giro d’Italia cycling race, which starts May 9 with or without Lance Armstrong, I thought I would take my own “Tour of Italy” via the pavilions at Vinitaly today. Already day 3 and I have only seen one third of the pavilions, so I decided to at least walk through as many as possible in order to get a closer look at how each province sees itself. Starting in the north east of Italy, we have Trentino, whose pavilion has a fun burgundy and white wine bottle graphic exterior. Inside the stands are like little wood ski chalets, and again I am reminded of the Matterhorn ride’s alpine decorations and costumed operators. 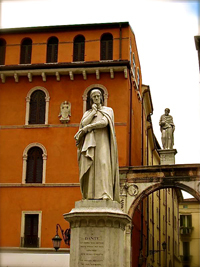 (Yes, I will TRY to make this my last Disneyland comparison) In the Eastern portion of the country lies Emiglia Romana, where you will find Modena, famous for Tortellini, Pavarotti, Balsamic Vinegar and of course Ferrari. For you Lambrusco lovers out there, this is where you will find your treat. 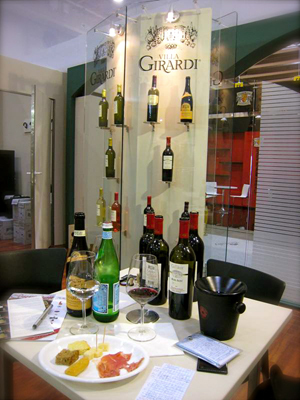 Heading all the way south, we finally stop in Sicily’s pavilion for some tasting. 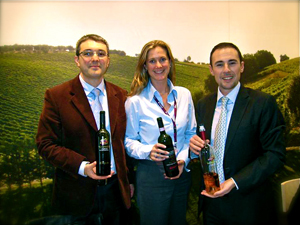 I started with a small winery that makes only three wines, Morgante. Carmelo Morgante was kind enough to talk me through their IGT selections of Nero D’avola wines, beginning with their entry level Nero with its cranberry tartness, then on to the velvety Don Antonio. The most interesting selection was what will be called “Zamara” which is translated to the agave plant. I’m sure it was the power of suggestion, but this mellow Nero’s herb flavors reminded me of tequila. A quick sip of their soft and enjoyable Grappa made from Nero with some almond cookies and I am ready to continue my journey. Heading back up the front of the boot, I stop in Campania for a taste of my long lost friend, Fiagre at Antonio Caggiano. Known for their Taurasi(s), like Macchia dei Goti DOCG, I am impressed by their whites. 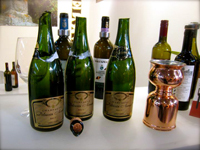 The Fiagre is a wine comprised of perfumey Fiano di Avellino and the minerally Greco di Tufo. The result is something best described as “tasty” and definitely enjoyable with and without food. To complete my “Giro,” I will make an important stop in Piemonte to Beni di Batasiolo, another friend lost in the export shuffle. Introduced by my friend Mike Grulli at Vinottimo, I enjoyed their Dolcetto, Barbera(s) and Barolo(s) while in Naples, but have since lost touch. Riccardo March, the US export manager greets me and makes introductions while buzzing from table to table. I sit down with Paola to start tasting the whites like Serbato Chardonnay, aged in stainless steel only, and my favorite the Gavi di Gavi with its soft mineral taste and peach aromas. We were lucky enough to be joined by the winemaker when I began to taste the reds. I was excited to compare the Barbara d’Alba with the Barbera d’Asti and discover that I prefer the softness and fruitiness of the Alba. We move on to the grape, which has mystified my taste buds for years, Nebbiolo, and its wines, Nebbiolo, Barolo and Barbaresco. These wines offer more tobacco and spice flavors and tannins that stand up to complex dishes. My favorite was the 2004 Vigneto Cerequio Barolo, made from the grapes of one of the most historical vineyards in the Barolo region. With wild berry flavors and just a hint of tobacco, this is a well-balanced and friendly Barolo. I am lucky to say that my virtual tour of Italy turned into a real tour of Verona as I was invited to the Batasiolo dinner that night at a wonderful restaurant in the center of the old city, “I Masenini.” This was an incredible experience, not just because I was getting to taste these wines in their native environment (i.e. with complex dishes like Amarone risotto and slow roasted veal), but I was also able to meet and enjoy the company of a fun and vibrant group of people. So fun in fact that we headed to a club afterwards for some dancing! 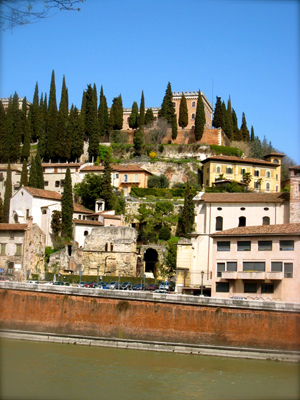 I found Club 59 in Verona to be a great alternative to the highbrow ultra lounges in Las Vegas. This was a party, with people dancing, laughing and drinking and simply enjoying life. I forgot about being tired and joined in, but in the back of my mind wondering how all of these people would be ready for another early morning tomorrow. I decided that one of my hosts, Riccardo definitely has a little plutonium source somewhere in his jacket, and the others as well simply enjoy what they are doing. And in a small way, I can understand what keeps Lance Armstrong wanting to continue to race, and to be ready to tackle the Giro d’Italia next month, it is simply the passion for living life and living it well. My four-leaf clover brought me all kinds of luck today, that or the stars were aligned for this normally stressed and stubborn Aries. Maybe it was because, instead of rushing to the expo, in the rain, straight from the house, by bus, I decided to have a proper Italian breakfast at a bar with my host, Piero. The sun was out which meant that I got to ride on the scooter, and also meant a nice warm brioche and fabulous cappuccino. We stood at the counter of course, as the bar is not really a place to dilly-dally, and even though the process of ordering, eating and paying only took 5 minutes, it was truly a break. Two minutes later I was wishing I had a “helmet cam” for the drive to the expo. We dodged in and out of stopped traffic, and as we came within centimetres of the other vehicles, all I could think of was “keep your arms and feet securely inside during the ride.” This may not have been as fast and furious as Space Mountain, but it was just as intense. I headed to the VIP lounge to do some writing and check email, then noticed in the day’s program that there was an organized group tasting and lecture on Umbria’s gem, Sagrantino, kind of a forgotten favorite of mine since it is hard to find in the states. I quickly finished up and headed to the lecture rooms and when I arrived, heard the receptionist telling another guest that the tasting was full. When I approached, she suggested that I wait to see if there were any no-shows, and I did. A few minutes later, I was asked for my card, and about Grapelive, and then was given entrance to the tasting! A stroke of luck, because at the tasting I learned much more about the area, the characteristics of the wine, and tasting in general. I sat with six glasses in front of me arranged on a paper mat, a full bottle of water (yeah!) and a little opaque plastic spitting cup. There was also a beautiful folder full descriptions of each wine and notepaper and a brochure of the consortium for Sagrantino. A panel of three gentlemen talked us through each wine, and though it was in Italian, it was understandable and enjoyable. Afterward, I found a quiet spot and called my friends Mike and Mary Grulli of Vinottimo, who represent fine wines to the stores at overseas military bases. I met Mike about eight years ago when I lived in Naples, and immediately learned to trust his every suggestion. He guided me and many enthusiasts through the regions of Italy via their wine, and I was fortunate enough on a couple of occasions to have bottles signed by the winemakers because of special appearances that he had set up. Luckily, I caught them at just the right time before a busy afternoon, and we met up at Tommasi where I was re-introduced to the owner, jovial Franco whom I remembered from a spectacular wine dinner he presented in Naples years ago. 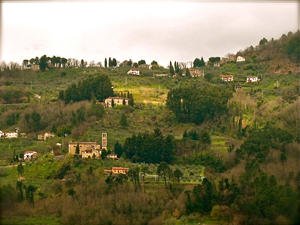 Determined to stay on course with appointments, we all rushed off, and I headed to Marchesi de Frescobaldi, whose estates include Pomino, Nipozzano and Castelgiocondo, and whose collaboration with Mondavi created the Luce and Lucente wines. Mike had warned me not to get my hopes up of meeting one of the family members, and when I approached the two-story stand, which was larger than my last apartment, I could see crowds trying to get past the velvet ropes. When I gave the receptionist my card, I caught the eye of a beautiful young woman with olive skin, green eyes and fabulously curly black hair, and it turned out that she was my contact. Agnese had seen my photo on Grapelive and recognized me, and within seconds I was behind the velvet rope. ”Where are the flashbulbs?” I thought as I looked back at the eager crowd, looking for paparazzi. As we headed upstairs, Agnese stopped suddenly and introduced me to Tiziana Frescobaldi! What an honor this was for me, and another example of my good luck gone wild. We found a table on the open deck upstairs and began tasting from the Pomino estate: Pomino Bianco (Chardonnay and Pinot Bianco), Pomino Benefizio (a Chardonnay Cru), and the Pomino Rosso (Pomino Nero and Sangiovese), which was my favorite. While writing my notes, I wrote that I simply wanted to keep drinking this wine. There were fresh aromas of cherry and fruit and a ruby color that continued all the way to the edges. It was dry and tannic, but still allowed the fruity raspberry flavor to emerge, and then finish with a slight bitterness, which I liked. On to Nipozzano estate and its namesake wine, a 2006 Chianti Rufina Riserva, then Montesodi, a 100% Sangiovese Chianti Rufina Riserva, and finally the Mormoreto, a “Super Tuscan” Bordeaux-style wine, and one I remembered bringing home from Italy and enjoying with a special occasion dinner a few years ago in Hawaii. I think the occasion was the Kona earthquake, and since there was no power, we decided to not chance the Mormoreto going bad in the wine ‘fridge. Uh huh. This was my favorite of these three, with its enticing dark purple rather than ruby color, and the aroma of spices, particularly clove and red berries. In the mouth, this wine goes through phases, the tannins, then a balance of acidity, then the full-bodied feel and then a long finish of spice. This is a wine to drink and enjoy, and every sip will reveal something new. Pulling away from the focus of these impressive wines, I noticed the other groups tasting and how they were talking and enjoying themselves thoroughly, like it was Saturday afternoon by the sea, not a frantic convention. 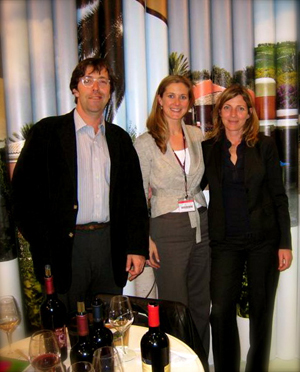 At this point, Tiziana joined us and we talked about my future visit to their estates. I was told that this was just a preview of what I would experience there, and I cannot wait. Worth noting is their Saltagrilli Rosato, a rosé from a blend of Sangiovese, Merlot, Cabernet Sauvignon aged in stainless steel then six months in the bottle. This is a very drinkable wine, with strawberry flavours, fresh taste and a simple finish, perfect for summer. 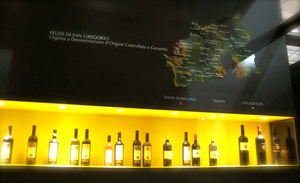 I fought the urge to return to the sanctuary of the lounge and headed to Feudi di San Gregorio, a winery that I knew well in Naples, and that I have watched grow over the last eight years. Alessandro welcomed me inside their stylish booth done in black and yellow, and again I could have been in any little bistro in the world. My favorite wines in Naples and the Campania region in general are Greco di Tufo and Taurasi, and this winery excels at both. This winery is excited about expressing the terroir of their region and the indigenous grapes. To do this, they employ a winemaker who spent years as a local farmer in Campania, someone who knows the land, the climate and the plants that grow here. This is a particular source of pride for them, Alessandro tells me. After tasting their three new sparkling wines, then the entry-level Falanghina, Fiano di Avellino and Greco di Tufo, we moved on to their more refined cousins, two of which have been designated DOCG in recent years. The Serrocielo Falanghina DOC had aromas of apple and caramel, and intense complex flavours that sat full and round in the mouth. The Pietracalda Fiano di Avellino DOCG showed off this grape’s heavy perfumed aroma that reminded me of Hawaii’s tropical fruits. The taste was round with some nice acidity and ripe guava flavours. The award-winning Cutizzi Greco di Tufo DOCG had mellow aromas of minerals and fresh cut grass, and the taste was like chewing on a piece of mild lemongrass on a sunny day. This is a fantastic wine with fish and a signature dish of the region, linguine with clams. Moving on to the reds, this tasting train was only gaining momentum. We tasted the four Aglianico reds chromatically, something I had not yet done. The 2007 Rubrato IGT was first, with its cherry, mushroom and spice aromas, ripe cherry, tobacco flavours and tannic finish. Second was the 2005 Taurasi DOCG which had a nice velvety feel and the signature chocolate aromas and graphite on the tongue at the finish. The 2002 Piano di Monte Vergine Taurasi Riserva DOCG was full of pepper, vanilla and smoke aromas and a cherry jam flavor with a tobacco finish, all in a velvety package. I enjoyed the butterscotch and fresh tobacco aromas of the 2005 Serpico Irpinia Aglianico IGT, which was a very chewy wine with intense fruit and toasted almond flavors. It was a treat to get to taste the 2005 Patrimo Merlot IGT, a dark, inky ruby color with its coffee and berry jam aromas and long fruit and spice finish. At this point, a nice piece of Neapolitan pastiera, a traditional Easter pie reminiscent of cookie dough was offered to me, perhaps because my eyes had glazed over by this point…but what would go better with pastiera than the Privilegio Fiano dessert wine? I don’t know, but I’m thinking water at this point. However, this dessert wine surprised me with its refreshing acidity and intense, fresh flavors due to the grapes being shriveled inside the winery and not in the sun. It complements the flavorful and (not too sweet) pastiera beautifully. 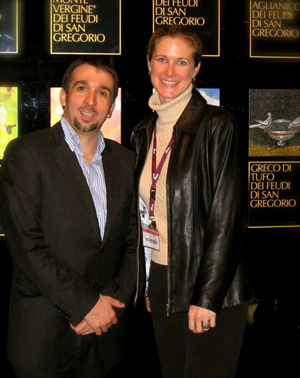 If Las Vegas is the “adult’s Disneyland”, then Vinitaly is the wine-lover’s Disneyland. With cleverly created stands that look more like enticing mini bistros, some with two stories, and all decorated to represent the characteristics of the region or winery, this is definitely an e-ticket adventure. 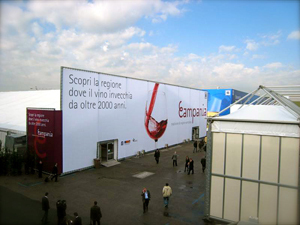 There are no fewer than 16 exposition halls, for the wineries alone at this enormous convention centre, just 5 minutes south of Verona’s ancient arena. As I write this, I hardly remember that it was pouring rain all day long, conveniently starting when I went to the little dry cleaners down the street to pick up my dutifully pressed shirt, and continuing as I walked the bus stop and made my way to the convention centre. The size of the crowds matched the enormity of the expo halls, and I was grateful to have purchased and printed my ticket online before arriving. The chaos at the entry was that wonderful, crazy Italian kind of chaos…that is better left to the Italians of past the entry, I was suddenly swept up by a crowd of police who were surrounding a well-dressed, Italian, and with the numbers of cameras flashing, I estimate this to be some government figure. So, rather than swim against that stream, I just went along pretending that I was supposed to be there, and will see if I can recognize his face in the news later. With 30 minutes before my first appointment, I decided to detour through another pavilion and was thrilled to see a winery that I recognized from a trip through the Veneto years ago, Guerrieri Rizzardi. Not familiar with the proper etiquette, I simply presented myself and told the gentleman that I had visited their tasting room previously and enjoyed their wines. Luckily he spoke English, which made the tasting experience, my first of the expo, a smooth one. 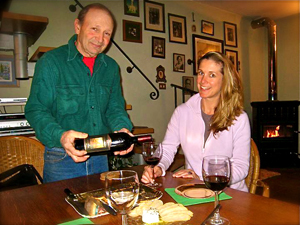 Giuseppe, a member of the family, began pouring white wines to taste. My favorite was the 2008 Costeggiola Cru Soave Classico DOC, which has a little more chardonnay that regular soave, about 30%. This wine was delightful, with apricot aromas, and ripe peach and almond flavours with a lingering finish. I was already thinking about lunch, which is normal for Italian wines, as they just get better with food. Without progressing to the reds (I will return later), I headed over to another pavilion to find Vignalta and meet Lucio Gomiero. After discovering that we are not only neighbors in Carmel Valley, but also business neighbors in Salinas where he farms radicchio, we got to tasting. 11 wines later, and much discussion, I was thoroughly impressed with the span and quality of their wines. Lucio reminds me of my father, always tinkering, wondering how to make it better and even create something new. For example, he is expecting to receive DOC classification this year for a new varietal, Manzoni, born from Pinot Bianco and Riesling. The most surprising white I tasted was the Sirio moscato as moscato is something I tend to avoid because of the sweetness and characteristic flavor, but Lucio told me I’d be surprised.. The aroma was distinctly moscato, what else? And it reminded me of honeysuckle flowers. Then the taste, it was an explosion, just as he said with intense flavor and a wonderful bit of tartness that kept it from being too sweet, and it wasn’t, it was absolutely dry with a long, dry finish. Impressive. The story of the reds is very interesting, as there are two different types of soil as a result of the volcanic activity in the area. One is decomposed lava, and the other limestone that was pushed to the surface by volcanic pressure. Two wines composed of Merlot and Cabernet, Arqua, and Gemola, named for their respective neighboring but different areas produced wonderfully different results. My favorite was the 2005 Arqua composed of 65% merlot and 35% cabernet sauvignon. Lucio describes this as “the Bodybuilder” wine, and I agree. At 15% alcohol, it is well balanced in its abundance of acid, tannins and alcohol. I learned that the high alkaline limestone soil creates high acid grapes, which is one reason for the difference between the two wines. This wine, he tells me is the perfect expression of the specific terroir in the Colline Eugani, and he says it will inspiring pride. I am a fan, and so is Gambero Rosso, as it bestowed the 3-bicchiere award on this wine last year. We move on to dessert wines, and I am grateful for the little spittoon and the encouragement by friends in the business to learn how to use it. I can still concentrate. Of the three dessert wines, a late-harvest Moscato, a “Fior di Arancio” and the Moscato Nero, my favorite is the award-winning Fior di Arancio, or Orange Flower, a type of ancient moscato. This is one of the most surprisingly interesting wines I have ever tasted. I usually choose something like Vin Santo over sweet dessert wines, but this one I would gladly enjoy again and again. These grapes grow in loose clusters and are actually shrivelled inside the winery, not on the vine, so the concentrated flavor is fresh and bursting, and not “cooked.” The aroma to me is all orange blossom, and the taste is caramelised, but fresh with honey and apricot and orange peel. This is a stunner, and I can’t stop saying “wow!” Lucio tells me he hears that a lot and just laughs. We have enjoyed so much time tasting that I leave the stand and make a beeline to the sandwich stand I saw on the way in. It is like stopping at a packed Autogrill on the Italian Autostrada but I manage to get my order in for a warmed Panini of bread, ham and cheese and a much-needed bottle of water. 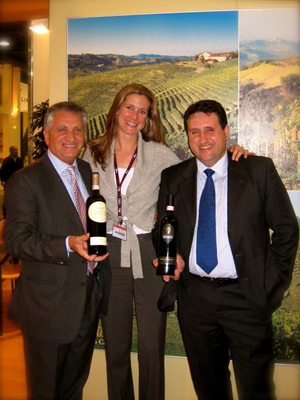 Mastroberardino, one of my favorite wineries in the Campania region, from when I was living in Naples, was next. The stand was busy, but since I had an appointment, I was seated and the English-speaking assistant, Laura chatted with me over the first taste of Sannio Falanghina until the winemaker, Massimo arrived. It is such an honor to have the opportunity to hear the winemaker talk about his wines, and this was a treat for me. He described the next wine, the Fiano di Avellino, which is rich in minerals from Mt. Vesuvius as an “expression of the philosophy of this grape” This wine’s aroma is intensely perfumey and floral, as if it were just wafting through the air, but the taste is substantial and different with fresh grass, mineral and light fruit flavours. We moved on to the Greco di Tufo, a favorite of mine, especially with shellfish, like linguine with whole clams. As the director of the winery, Dario Pennino joined us, I was enjoying a fun surprise – the Lacrimarosa, or “pink tears”, a fantasy name which is a common occurrence in the south of Italy. This rose is 100% Aglianico and complex with a perfectly dry finish. We instantly switched the topic to Neapolitan pizza, as this wine would certainly be great with it, especially in the summer. Onto the real Aglianico(s) we went, the bold reds of the region, which are designed to accompany the roasted lamb and complex meat dishes of the region. The Taurasi is made by combining batches aged in toasted smaller barrels and larger raw barrels, which gives it many layers of flavors like vanilla and coffee, then rosemary and tobacco. The aromas of tobacco and leather reminded me of the acres of tobacco drying in the summer sun that surrounded the military base where I lived in Naples. When I told Mr. Pennino and the winemaker that I still had one bottle left of their special label “Historia” aglianico from 1997, he asked me to wait and told me he had a surprise for me. 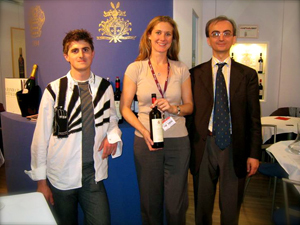 He returned and presented their prize bottle, a 1999 Aglianico Riserva special label called “Cento Trenta” or one hundred thirty, to mark the 130th year of export of the wines. 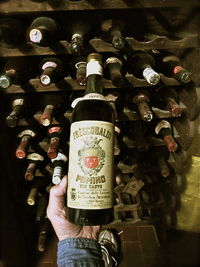 The three progenitors of Mastroberardino grace the label, and I was given the story of Angelo’s travels through South America at the turn-of-the-century and the correspondence between him and his family that still survive in the cellars. This was the first time I had experienced the taste of graphite in a wine, and it was pronounced, like having a pencil in your mouth. Ripe with aromas of licorice, cherry and spice, which become the intense flavours, this wine is the perfect accompaniment to the roast lamb with rosemary. I really look forward to visiting Naples again at this point, and I will definitely be visiting the winery when I do. After a visit to the VIP lounge (thanks to my ticket) for a glass of water and some peace and quiet, I head home. All in all it was an excellent day despite being completely drenched in water by a passing car while walking to the bus! Thanks to the generous and kind workers at a food stand who gave me a handful of paper towels to dry off with, I can forgive the water today, and focus on the wine. 2007 Maxine-Francois Laurent “Soif Il Fait” Cotes-du-Rhone, France. This ripe and perfumed Cotes-du-Rhone shows amazing Syrah intensity and depth with lush textures and full body. The nose is lofty with violets, white flowers, cassis and compote leading to a huge palate of plum, grenadine, blueberry, cherry liqueur and black currants. This is a wonderful and complex wine that has flashes of lavender, dusty earth, white pepper and grilled meat, finishing long and lively. The famed Kermit Lynch imports this Cotes-du-Rhone and it is a rare beauty, so search it out and discover a super value.